Today at the nursery something caught my eye – the most gorgeous plant. Planted in a rather large planter was a tall bright pink bougainvillea under-planted with something that looked vaguely familiar, but not quite. I looked, I admired and moved on … but I couldn’t stop thinking about it and I had to go back. After looking at the hundreds of plants available for sale, I HAD to have this one plant that is not! On closer inspection I discovered it is a Trachelospermum ‘Cameleon’. “Chameleon” has the most exquisite colouring … gorgeous variegated leaves but instead of only flowering, the leaves change from green to white to pink. 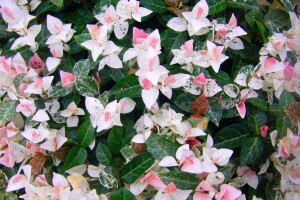 Variegated white and pink leaves – heavenly. Oh, and I have to mention that this photograph simply does not do this gorgeous plant any justice. It is so much more beautiful in reality. After deciding that I really “Needed” one of these, I called over the assistant and pointed it out offering to purchase two or three. He went running around the nursery and eventually came back to tell me they don’t have any for sale and didn’t know if or when they would get them again. He kindly took my name and number and will call me if they get them again. At Ferndale they had it as a ground cover (i.e. not creeping). I liked it that way although from what I can tell it would probably do very well as a creeper too. Now I’m thinking … if they don’t call me soon with the happy news that they found me one of these plants, I am going back there and asking them to dig one of theirs up for me … I have to have at least one of these!! Is anyone familiar with this plant? I would so love some credible information about it. Ferndale Nurseries contacted me on Friday morning (11 March 2010, i.e. 3 days later) to tell me they had my plants! Hows that for great service! I went there to get them – they got ten in, another person had ordered two of them, so I took six. They were quite small and pricey (quite a bit more than I normally spend on a plant this size), but I really love them and believe they are going to be a great addition to my shade garden. Here is my follow-up post. Oh Wow! Yes that is it – I still haven’t found a photograph of it with flower, so I will have to buy one so we can all see how it looks in flower. 20cm growth per annum is indeed very slow – I will need more than one of these for sure. Thank you SO much for the link and info! I like variegated plants. This one looks very nice. Good luck in your acquisition attempts. Hi my freind, Oh yes – I remember that beauty!! It really is a very pretty plant and I know how you feel about it! Ferndale will have to do their very best to get one for you. If it is a rare plant, than all the more reason to have it in your garden!! Thats a good idea – if they won’t dig up the plant for me I’ll ask them for a cutting or two – I’m such a good customer there I think they might oblige. A beautiful plant and completely new to me. Good luck in finding it. Not familiar with that beautiful little flower, but I do hope you find one! This is the first time I’ve heard of a Chameleon plant. Does it change color? Hope you get your plant soon. But sometimes, after a few days, the ‘need’ changes. Hi One – I don’t think it changes colour, it gets white flowers in summer as well as having the pink and white leaves. I hope you get at least one of these plants. They look very pretty. Isn’t that funny that you wanted the one plant that wasn’t for sale? They shouldn’t have brought it if they weren’t willing to share! Looks like a promising find! I hope you’re able to get some – I’ll look forward to reading about how it performs! That is beautiful – I have never seen it before.